Article from Rare by Daniel DePetris. Secretary of State Rex Tillerson is everybody’s favorite punching bag. 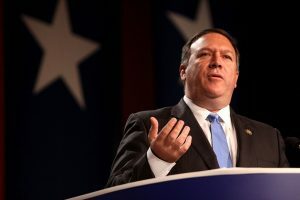 It has been that way ever since he accepted President Donald Trump’s offer to lead the State Department, and it will continue to be that way for as long as he stays in the job. A report this morning from the New York Times that Chief of Staff John Kelly is orchestrating a bureaucratic musical chairs scenario whereby Tillerson would be pushed out and replaced by CIA Director Mike Pompeo should therefore not come as a complete surprise. Tillerson’s stock in the administration has fallen precipitously since the summer, when Trump publicly undermined his own Secretary of State’s effort to get the Saudis, Emiratis and Qataris around the table to talk about a solution to the diplomatic standoff within the Gulf Cooperation Council. President Trump would eventually come around to the notion of being impartial — even suggesting to Gulf Arab leaders that they come to Washington to talk about a way forward — but Trump’s pro-Saudi tweet was covered so extensively and reverberated throughout the region that the damage was already done. Tillerson left feeling not only undermined, but political weakened. The Qatar episode made it look as if he was on the outside looking in, cut off from the heavy hitters in the administration. Once a bombshell NBC News report was published in October, in which anonymous officials disclosed that Tillerson called Trump a “moron” for suggesting a massive increase in the U.S. nuclear weapons arsenal, the relationship between the two men was largely broken beyond repair. Rumors of Tillerson’s ouster, however, are further complicated by the fact that Pompeo may take over for him. That may the most disturbing part of this entire story — that somebody as dogmatic, ideological and partisan as Mike Pompeo would be responsible for managing U.S. foreign policy. No, not pompous Pompeo! He cannot be trusted.